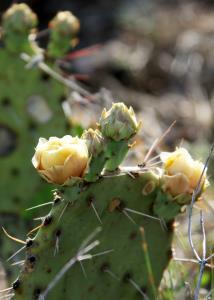 One of the first cactus flowers seen in the park. Numerous buds on the cactus so it should be pretty colorful soon. Temp around 65 at start, end at 75. Sunny with light winds. Easy hike along familiar trails. LOTS of bird activity singing and buidling nests. Trails all dry and easy to walk upon. Not really a lot going on but enjoyable nonetheless.